With the Northrop Grumman Lunar Lander Challenge just over a week away, I've been touching base with all of our Judges. Almost all of them will be returning next year, but I wanted to quickly mention one who won't. John Herrington, a NASA astronaut and distinguished Naval aviator, was kind enough to be a member of our Judging crew in 2006 and 2007. He was a great addition to the team, and a lot of fun--a great guy to work with. This year, though, he won't be able to join us. He's got a good excuse, though. He's actually in the middle of "RockeTrek, a 4,000 mile bicycle journey with stops planned in eleven states to "to promote and encourage student participation in science, technology, engineering and mathematics (STEM)." 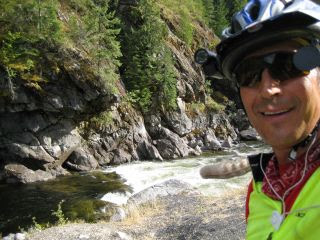 John's got a nice website up promoting the ride, and you can even follow along with John on Google Earth, or read his trip blog.